FREDERICK, Md. – Though for the second straight season Jackie Bradley, Jr. and the South Carolina Gamecocks celebrated a College World Series championship on the diamond in Omaha, Neb., Bradley’s junior season was something of a personal struggle. 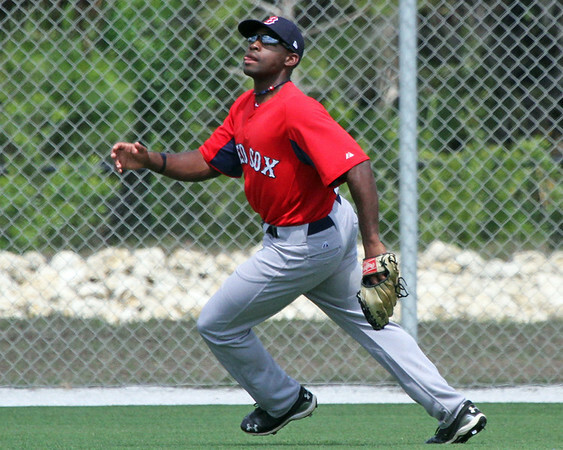 The 22-year-old outfielder bookended a season of struggles at the plate with a long stretch on the sideline due to a wrist injury, all of which caused him to fall to Boston with the 40th pick in the 2011 MLB Draft. After signing on the Aug. 15 deadline, Bradley played just four games in Short-Season Lowell before the season ended. But despite the lack of consistent game action entering this season, Bradley said he had the kind of spring that makes one quickly forget the long layoffs of 2011. Though he collected just two hits over the course of three games last weekend for High A Salem, Bradley was the sole position player who could have entered Monday’s off-day believing he was already in mid-season form. He executed his plan at the plate well and worked several aspects of the “Red Sox philosophy,” Salem manager Billy McMillon said. That plan was evident in the season’s opening at-bat Friday night against Frederick. Bradley worked the count full for the first of many times on the weekend before driving a ball to the warning track in left-center for a loud out. In his next plate appearance, Bradley drove the first pitch, an outside fastball, down the left field line for a single to plate Salem’s first run. He drew his first of two walks on the evening in the fourth inning, and also got on base and stole second after being plunked in the eighth inning. He drew two more walks on Saturday to end the series with a .467 OBP. Similarly, Bradley opened Saturday’s game with a hard-hit out to left-center field, again going with the pitch on an outside fastball. He did the same on a ninth-inning groundout later in the game. While his SoxProspects.com scouting report indicates that hitting the other way was an area in which Bradley could use improvement, his defense was as-advertised. Bradley’s first step was always the right one, and even when he couldn’t make the catch, it was striking just how far he tracked into the gaps to chase balls down. In Friday’s game, Bradley was well into left fielder Brandon Jacobs’ territory on a drive to the gap that went just over his head, and he nearly injured himself in the first inning after leaping into the wall in pursuit of a drive to right-center that ultimately came out of his glove. The first came on a throw to try and double up a runner at first after Bradley made an impressive running catch in center field. Both Bradley and McMillon excused the error, which came on an accurate throw that was interfered with by the baserunner. The latter was on a throw to third that ended up in the Salem dugout. Bradley said he decided not to throw to third and to lob the ball in, but his arm sped up on him. McMillon said he was trying to force the issue. “When he’s under control, he’s as good as anyone out there,” McMillon said. Overall, McMillon believes Bradley’s consistently strong defense will buoy him should he maintain his misleading .200 batting average as Salem surges forward in its Carolina League campaign. Now that he’s finally healthy and ready for full-season ball, Bradley hopes that his batting will carry him just as much as his glove.